WASHINGTON, DC -- The US has accused Russia of using its energy supplies "as a tool of coercion" to try to control Ukraine. Nearly a third of the EU's natural gas comes from Russia. It comes after Russia warned European countries of possible gas supply cuts because of Ukraine's energy debts. Separately, NATO has defended the accuracy of satellite images which it says show Russian troops massed on the Ukrainian border in recent weeks. A Russian official earlier said the images depicted a military exercise that was held in August last year. NATO says the satellite images it unveiled early on Thursday show some 40,000 Russian troops near the border in late March and early April. They also reveal sophisticated warplanes and helicopters. Later, NATO released additional images, some dating back to 2013 and others from early 2014, purporting to show the same areas unoccupied prior to March. In a statement, the alliance says the images show that Russian claims that they are old were "categorically false" and that there was no evidence of military activity in these areas in 2013 or early 2014. In Washington, state department spokeswoman Jen Psaki condemned "Russia's efforts to use energy as a tool of coercion". She added that gas prices Ukraine was having to pay Moscow were not set by market forces, and that Washington was working with Ukraine to provide financing and help it find enough gas. There are fears that current tensions between Russia and Ukraine could trigger gas shortages in Europe, as pipelines transiting Ukraine deliver Russian gas to several EU countries. Russian energy giant Gazprom says Ukraine owes it $2.2bn (£1.2bn; 1.4bn euros) and recently doubled the price it must pay. Russian President Vladimir Putin wrote to 18 European countries on Thursday warning that Ukraine's delays in paying for Russian gas had created a "critical situation". 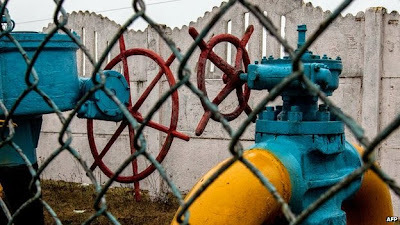 The letter released by the Kremlin says that if Ukraine does not settle its energy bill, Gazprom would switch over to advance payment, and if those payments are not made, it would "completely or partially cease gas deliveries". Previous Russian gas disputes with Ukraine have led to gas shortages in several EU countries. The EU says it has extra supplies to deal with any such disruption now. Meanwhile, US President Barack Obama has spoken to German Chancellor Angela Merkel by phone about the growing crisis in eastern Ukraine, where pro-Russian separatists remain barricaded inside government buildings in Donetsk and Luhansk. President Obama told Ms Merkel that the US and its allies should prepare for fresh sanctions against Russia if the crisis escalates. The separatists in the east - a mainly Russian-speaking region with close ties to Russia - are demanding referendums on self-rule. In Donetsk they have declared a "people's republic". Gunmen have been seen among the protesters in Luhansk. Ukraine fears that the separatist actions are a provocation similar to the protests that gripped Crimea days before Russian troops annexed the peninsula last month. President Obama and Chancellor Merkel also discussed issues relating to talks due to take place in Geneva next week between Russia, Ukraine, US and the EU to try to end the impasse - the first four-way talks since the crisis began.